I have missed creative Space Thursdays! The only substantial creating happening around here lately is in the Kitchen. 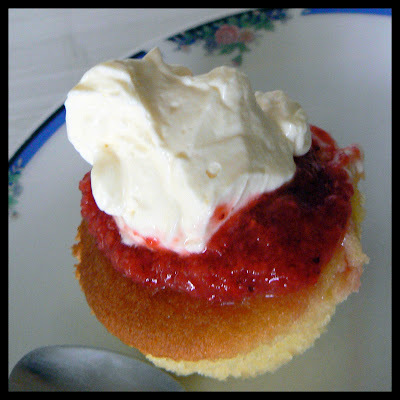 Cupcake topped with pureed strawberries and whipped cream. Our kitchen has been most creative these holidays. Everyone's been enjoying the making & baking. You can visit my kitchen any time! Delicious. ohhhhh yum! can it get any better that!!!!!!!!!!!! Did you grow the strawberries? Our strawberries have been awful this year... we've had one mini strawberry. Our son thought we were growing them for fairies!!! I'm inspired...time to put the kettle on and enjoy a cuppa and a slice of Christmas cake!